Mens USA offers wide range of choices in the suit selection. They provide suits that are 100% defect free. As far as the quality concerns are considered it is the most reliable source, where you can be absolutely be assured about the best quality. MensUSA strives with the mission to satisfy the customer's needs and keep them satisfied throughout. MensUSA specializes in the production of men pinestripe suits. The pinstripe suits cater to the need of any situation whether it is personal or professional; they are the most desired suits by most of the corporate needs as these suits meet the most sophisticated needs of the corporate world. These suits reflect a true men's personality. 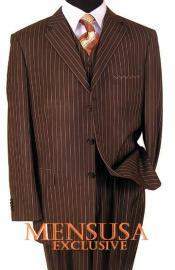 The famous brown pinestripe suit comes vested and it is one of the most desired three buttoned suit choice. It has a vent and it is double pleated so as to cater to the need of perfect fit. It has a fully lined jacket, it has unfinished bottoms and lined jackets and pants. The suit is designed in such a way that they provide a look in which men look slimmer, elegant and tall. These suits have a padded shoulder and they are designed in such a way so that they meet every small requirement to make this suit a sophisticated product.